CpG island methylator phenotype (CIMP) is found in 15–20% of malignant colorectal tumors and is characterized by strong CpG hypermethylation over the genome. The molecular mechanisms of this phenomenon are not still fully understood. The development of CIMP is followed by global gene expression alterations and metabolic changes. In particular, CIMP-low colon adenocarcinoma (COAD), predominantly corresponded to consensus molecular subtype 3 (CMS3, “Metabolic”) subgroup according to COAD molecular classification, is associated with elevated expression of genes participating in metabolic pathways. We performed bioinformatics analysis of RNA-Seq data from The Cancer Genome Atlas (TCGA) project for CIMP-high and non-CIMP COAD samples with DESeq2, clusterProfiler, and topGO R packages. Obtained results were validated on a set of fourteen COAD samples with matched morphologically normal tissues using quantitative PCR (qPCR). Upregulation of multiple genes involved in glycolysis and related processes (ENO2, PFKP, HK3, PKM, ENO1, HK2, PGAM1, GAPDH, ALDOA, GPI, TPI1, and HK1) was revealed in CIMP-high tumors compared to non-CIMP ones. Most remarkably, the expression of the PKLR gene, encoding for pyruvate kinase participating in gluconeogenesis, was decreased approximately 20-fold. Up to 8-fold decrease in the expression of OGDHL gene involved in tricarboxylic acid (TCA) cycle was observed in CIMP-high tumors. Using qPCR, we confirmed the increase (4-fold) in the ENO2 expression and decrease (2-fold) in the OGDHL mRNA level on a set of COAD samples. We demonstrated the association between CIMP-high status and the energy metabolism changes at the transcriptomic level in colorectal adenocarcinoma against the background of immune pathway activation. Differential methylation of at least nine CpG sites in OGDHL promoter region as well as decreased OGDHL mRNA level can potentially serve as an additional biomarker of the CIMP-high status in COAD. Maria S. Fedorova and George S. Krasnov contributed equally to this work. The online version of this article ( https://doi.org/10.1186/s12881-019-0771-5) contains supplementary material, which is available to authorized users. Colon adenocarcinoma (COAD) is a common and socially significant disease, nevertheless, some mechanisms of its onset and progression have been studied insufficiently [1, 2, 3]. The advent of high-throughput “omics” methods has made it possible to detect alterations that occur during the malignant transformation and progression of COAD. These include changes in methylation patterns, mutation spectra, non-coding RNA profiles, cell signaling, as well as metabolic pathways at both mRNA and protein levels [1, 2, 4, 5]. “Omics” data are useful for molecular classification of malignant tumors, drug discovery, and developing personalized approach to optimize colon adenocarcinoma management. Traditionally, colorectal cancer (CRC) is characterized with several molecular features, these are: the presence or absence of microsatellite instability (MSI), chromosomal instability (CIN), CpG island methylator phenotype (CIMP), and spectrum of the mutations in the driver genes. The accumulation of multidimensional "omics" data on colorectal cancer made it possible to link these features and to develop consensus molecular classification of CRC. As a result of complex analysis of six independent classification systems, four consensus molecular subtypes (CMS) with distinguishing features were identified: CMS1 (“MSI/Immune”, 14%), CMS2 (“Canonical”, 37%), CMS3 (“Metabolic”, 13%), and CMS4 (“Mesenchymal”, 23%) . Like other malignant neoplasms, COAD is characterized by the alteration of various cell signaling and metabolic pathways, including energy metabolism [7, 8, 9, 10, 11]. Mitochondrial dysfunction and activation of glycolysis is a well-known hallmark of cancer [12, 13, 14, 15]. The activation of glycolysis is commonly accompanied with increased expression of hexokinases, which are the enzymes that participate in the first stage of glycolysis. This provides an opportunity to search for therapeutic targets among genes involved in cell energy metabolism [16, 17]. However, disturbances in gene expression, signaling and metabolic pathways can be different depending on particular driver alterations (e.g. mutations in RAS-RAF cascade). Previously, we found that expression of hexokinases was upregulated at the mRNA level in only 10–15% of COAD samples . Furthermore, it has been shown that increased expression of HK1 and HK2 in COAD tissue is associated with an unfavorable prognosis [19, 20]. Unsupervised clustering of the promoter DNA methylation profiles revealed four methylation clusters. Two of them contained tumors with elevated methylation rates and belonged to so called CpG island methylator phenotype (CIMP, CIMP+, and CIMP-positive) discovered in CRC by Toyota et al. [21, 22]. CIMP phenotype occurs in 15–20% of CRC samples and characterized by excessive methylation levels predominantly in promoter regions across the genome. CIMP-positive group can be divided into two subtypes, CIMP-high (CIMP-H) and CIMP-low (CIMP-L), according to the level of hypermethylation and some other features. A CIMP-high subgroup exhibits an exceedingly high frequency of genome hypermethylation; it is strongly associated with MLH1 promoter hypermethylation and with the presence of BRAF V600E mutation. A CIMP-low subgroup is enriched for KRAS mutations and characterized by DNA hypermethylation of a subset of CIMP-high associated markers as well as a unique group of CpG sites [1, 23]. Nevertheless, genome-wide methylation profiling revealed at least two more clusters containing non-CIMP samples. Both clusters predominantly included tumors that originated from different locations [1, 23]. Unfortunately, neither mRNA-Seq data nor miRNA profiling can help to differentiate these two non-CIMP clusters. Comparison of methylation clustering analysis with other quantitative “omics” data identified significantly overlapping only for one group: one out of three mRNA clusters partially corresponded to CIMP-high tumors, it was also enriched with hypermutated tumors. The absence of clear criteria defining CIMP-positive and non-CIMP tumors, especially their more detailed classification, makes them difficult to be identified in routine laboratory practice. Currently there are several approaches for the identification of CIMP-positive samples [24, 25, 26]. In terms of novel consensus classification, CIMP-positive COAD samples are mostly included in CMS1 and CMS3 subgroups. CMS3 is characterized by metabolic dysregulation and contains predominantly CIMP-low tumors. The most common alterations in CMS1 subgroup, which is mostly comprised of CIMP-high samples, are hypermutations, MSI, and strong immune activation. It is assumed that CIMP-high status is associated with MSI through the methylation of MLH1 promoter regions. Being inactivated, MLH1, a participant of the mismatch repair system, does not prevent the accumulation of DNA damage. However, the particular mechanisms of association between energy metabolic changes and CIMP status are still unclear . Therefore it is expected that the development of CIMP status is a part of more complex process. This involves specific driver mutations in the genes such as KRAS, BRAF, IDH1, and IDH2, the activation of glycolysis and general metabolic changes, as well as deregulation in many other cell signaling pathways [28, 29, 30]. Moreover, in some malignant tumors, the driver mutations in the genes encoding “metabolic” enzymes, such as IDH1, SDHx, and others, are sufficient to further establish methylator phenotype [31, 32, 33]. To summarize, the hypermethylation of cancer cell genome is considered to be commonly associated with the alterations in energy metabolism . Nevertheless, strong metabolic alterations (e.g. energy metabolism shift) are postulated only for CMS3 subgroup mostly including CIMP-low samples with KRAS mutations . Remarkably, CMS1 subgroup, predominantly represented by CIMP-high tumors, is not referred to be characterized with the metabolic alterations, first of all, by the energy metabolism shift. This fact does not play into the current understanding of the carcinogenesis mechanisms and empirically established common rules and tendencies in different tumor types. In the present work, we analyzed the association between CIMP-high status and alterations of energy metabolism in colon adenocarcinoma using RNA-Seq data from The Cancer Genome Atlas (TCGA) project. Obtained results were verified with quantitative PCR (qPCR) on a set of COAD samples derived from Russian patients. We revealed deregulation in the expression of several genes involved in the energy metabolism as well as activation of immune-associated pathways in CIMP-high colorectal adenocarcinoma. We performed differential gene expression analysis of TCGA RNA-Seq data (colon adenocarcinoma dataset). We focused on the patients of the Caucasian race (163 samples), identified in the database as “white”, as they most closely genetically resemble the Russian population. We carried out two comparisons: between pools of tumor and normal tissues, and between CIMP-high and non-CIMP tumor samples. CIMP status was included in the annotation provided by TCGA consortium . Differentially expressed genes (DEGs) were identified using the DESeq2 Bioconductor package . We selected top DEGs that passed DESeq2 FDR < 0.05 and Mann-Whitney p < 0.05 thresholds. Next, we performed over-representation (OR) and gene set enrichment (GSEA) tests for KEGG pathways and top DEGs using the clusterProfiler package . Then, we visualized differential expression profiles of genes involved in several KEGG pathways, including “Glycolysis/Gluconeogenesis” and “TCA cycle”, using the pathview Bioconductor package . Some KEGG nodes represent a set of proteins with similar function or isozymes. For example, lactate dehydrogenase (LDH) corresponds both to LDHA and LDHB. This means that the sum of bidirectional gene expression changes within the same KEGG node will be visualized as the retention in mRNA level. Therefore, we edited the automatically generated diagrams to reveal the expression alterations of each gene within the KEGG nodes if its differentially expressed. For detailed analysis of epigenetic characteristics in OGDHL promoter region across TCGA cohort, we compared CIMP-high and non-CIMP tumors in context of differential CpG methylation. TCGA dataset derived with Illumina Infinium HumanMethylation450 microarrays (17 CpG sites per gene, on the average) was used. Unfortunately, the original TCGA research paper  published in 2012 contains annotation on CIMP status only for samples analyzed with the previous generation of methylation-sensitive microarrays, HumanMethylation27 (only 1 CpG site per gene, on the average). Hence, we developed an approach of identifying CIMP-like samples based on genome-wide methylation profiling data. First, we selected CpG sites located in gene promoter regions using ENCODE genomic segments annotation (consensus of ChromHMM and SegWay methods; 110,000 of 300,000 CpG sites passed this filter). Next, for each sample we calculated MA, an average of 80th, 85th, 90th, and 95th percentiles (we used the average value in order to reduce stochastic noise) of β-values across passed CpG sites (β-value is the ratio of methylated alleles for a current CpG). The derived MA values indicated the overall hypermethylation level for each sample. According to MA distribution, all the samples were divided into three groups: “non-CIMP”, “CIMP-low”, and “CIMP-high”. As expected, CIMP-high status (versus non-CIMP) demonstrated statistically significant Spearman (anti)correlations with MSI-high (r = 0.53), hypermutation phenotype (r = 0.49), mutations in BRAF (r = 0.46), APC (r = − 0.27), and p53 (r = − 0.24) that perfectly agrees with the observations made for common CIMP-high samples, which had been selected regarding to annotation in TCGA consortium paper . In total, fourteen COAD samples (seven CIMP-high samples and seven non-CIMP ones) and matched morphologically normal tissues were obtained after surgical resection prior to radiation or chemotherapy. The samples were frozen and stored in liquid nitrogen. Morphological classification of the tumors was performed according to the WHO Classification of Tumors of the Digestive System . Only samples comprised of ≥70% tumor cells were included in the analysis. Written informed consent was obtained from all patients. The study was approved by The Ethics committee of Herzen Moscow Cancer Research Institute, a branch of the National Medical Research Radiological Center, Ministry of Health of the Russian Federation and was performed in accordance with the principles outlined in the Declaration of Helsinki (1964). Information on the patients and characteristics of the COAD tumors, including age, gender, grade, TNM staging, KRAS, NRAS, and BRAF mutations, microsatellite instability (MSI), and CIMP status, were determined (Table 1). Clinicopathological and molecular genetic characteristics of the COAD patients. Note: ↑ - expression increase; ↓ - expression decrease. Genomic DNA and total RNA were extracted from the fresh-frozen tissue. DNA was isolated using a MagNA Pure Compact Nucleic Acid Isolation Kit I - Large Volume (Roche, Switzerland). RNA was isolated with a MagNA Pure Compact RNA Isolation Kit (Roche). DNA and RNA quantification was performed on a Quibit 2.0 fluorometer (Thermo Fisher Scientific, USA). The RNA integrity number was measured using an Agilent Bioanalyzer 2100 (Agilent Technologies, USA). cDNA synthesis was performed using M-MLV Reverse Transcriptase (Thermo Fisher Scientific) and random hexamers. Sanger sequencing was performed for KRAS (exons 2, 3, and 4), NRAS (exons 2, 3, and 4), and BRAF (exon 15) . MSI status was analyzed using five common markers (D2S123, D5S346, D17S250, BAT25, and BAT26). MSI-high (MSI-H) status was defined as instability in two or more of the five markers, and MSI-low (MSI-L) status was detected as instability in only one of the five markers . The distinction between microsatellite stable (MSS) and MSI-low can only be accomplished if a greater number of markers is estimated. A unique clinical and pathological phenotype is identified for the MSI-high tumors (approximately 15% of malignant colorectal tumors). Tumors with MSI-low and MSS status appear to be phenotypically similar. The first step of this analysis was represented by sodium bisulfite conversion of genomic DNA (1 μg) using a Zymo Research EZ DNA Methylation Kit (Zymo Research, USA) with a final eluted volume of 20 μl. The converted DNA was diluted as 1:10 for MethyLight analysis, and the methylated and unmethylated controls (CpGenome Universal Methylated/Unmethylated DNA, Millipore, USA) were diluted as 1:80. A total of 5 μl of diluted DNA was used per PCR reaction. Additionally, serial dilutions of the methylated DNA control were run in each PCR plate for standard curve generation. Testing for CIMP status was performed using methyl-specific qPCR for eight markers localized in promoter regions of the CDKN2A (NM_000077.4 transcript, traditionally called p16), CACNA1G, IGF2, NEUROG1, RUNX3, SOCS1, CRABP1, and hMLH1 genes. Ogino et al. suggested using these eight markers for the routine laboratory stratification of colorectal cancer samples. Depending on amount of positive markers, samples were divided into three groups: CIMP-high, CIMP-low, and non-CIMP. A sample is considered to be CIMP-low if one to five out of eight markers are methylated, and to be CIMP-high if six to eight markers are methylated. The promoter regions of ACTB and COL2A1 genes were used for normalization [40, 41]. Gene expression levels were estimated by qPCR. Amplification was performed in triplicates using TaqMan assays (Thermo Fisher Scientific): OGDHL (Hs00971806_m1), ENO2 (Hs00157360_m1), and PKLR (Hs00176075_m1) on the ABI PRISM® 7500 Sequence Detection System (Thermo Fisher Scientific) following the manufacturer’s instructions. RPN1 and GUSB were used as reference [42, 43] genes. The PCR program was as follows: 10 min at 95 °C, then 50 two-step cycles of 15 s at 95 °C and 60 s at 60 °C. The total reaction volume was 20 μL. The Relative Quantitation software (Thermo Fisher Scientific) and “Analysis of Transcription of Genes” tool were used to analyze the qPCR data considering the efficiency of the PCR amplification. Relative expression levels of the target genes were calculated using the ΔΔCt method [11, 44, 45]. To analyze the differences in relative (tumor-to-normal) gene expression levels between groups of CIMP-high and non-CIMP samples, we applied the nonparametric Mann-Whitney U-test and considered p < 0.05 as statistical significant event. First, we performed the comparison between pools of COAD and normal samples based on TCGA RNA-Seq data. The analysis revealed the altered expression of glycolytic genes (a part of “Glycolysis/Gluconeogenesis” KEGG pathway) occurring along with the downregulation of many genes that participate in the tricarboxylic acid (TCA) cycle (a part of “TCA cycle” KEGG pathway). Together, these results suggest that the activation of glycolysis and suppression of mitochondrial respiration may occur in COAD (Additional files 1, 2, 3, and 4). Decreased expression was observed for only a few glycolytic genes, including HK2 (2-fold). Increased expression was revealed in a significantly larger number of glycolytic genes, including PFKM, ALDOC, LDHA, LDHB, PKM, PGK1, ENO3, GAPDH, PGK1, ENO1, and GPI (1.4-1.8-fold). As expected, the gluconeogenesis was predominantly downregulated at the transcription level and was characterized by decreased expression of PCK1 (8-fold) and G6PC (3-fold) genes. It is worth noting that we report only average changes in gene expression level between the two groups. Within each group, the expression level values are heterogeneous and take on various values. Due to the large sampling size, we were able to observe even slight trends toward up- or downregulation between the groups (e.g. 1.2-1.5-fold). These differences were statistically significant (Mann-Whitney test, p < 0.05). In contrast to glycolytic genes, the expression of genes involved in the TCA cycle and related processes was mostly characterized by decrease: SUCLG2 (3-fold); SDHD, PC, IDH3A, and ACO2 (2-fold); MDH1, SUCLG1, and IDH1 (1.5-fold). The increased expression (1.5-fold) was noticed for only three genes participating in TCA cycle - ACLY, IDH2, and MDH2. Next, we tested the hypothesis whether the disturbance of energy metabolism is related to increased genome methylation level (CIMP-high) and is not limited by “Metabolic” molecular subtype (CMS3) according to consensus classification . Bioinformatics analysis of TCGA data revealed the increased expression of the glycolytic genes in CIMP-high COAD samples compared to non-CIMP ones. The same cohort represented in TCGA database was used for this comparison as for described above. It is important that CIMP status description was already included in the annotation provided by TCGA consortium. These results are presented in the Additional files 5, 6, 7, and 8. 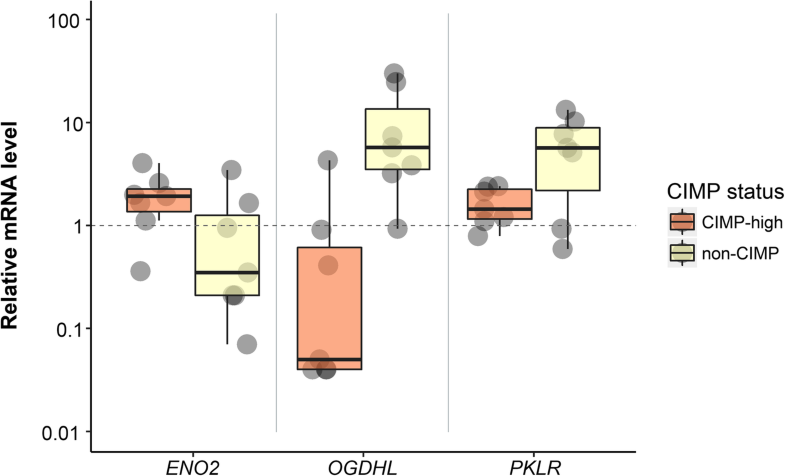 Most remarkably, the expression of the PKLR gene, encoding for pyruvate kinase involved in gluconeogenesis, was decreased approximately 20-fold. In all CIMP-high samples, the expression of PKLR was extremely low (only few reads per sample). Increased expression (1.5-3.0-fold) was observed for ENO2, PFKP, HK3, PKM, ENO1, HK2, PGAM1, and GAPDH genes. A less marked increase in expression (approximately 1.2-fold) was observed for ALDOA, GPI, TPI1, and HK1. Among the genes encoding TCA cycle enzymes, we observed that the expression of OGDHL was decreased 8-fold. Like PKLR gene, the OGDHL expression was very weak in 95% of CIMP-high samples. Several genes showed a slight increase in the expression, in particular, mRNA level of SDHA and DLST was increased 1.5-fold, while CS expression was increased 1.2-fold. It should be noted that in CIMP-high tumors we observed significant upregulation of dozens of genes involved in the immune response including chemokines, cytokines and many others that are predominantly expressed by immune cells. Based on the results of bioinformatics analysis, we selected several DEGs involved in energy metabolism (ENO2, PKLR, and OGDHL) for experimental validation with qPCR in CIMP-high and non-CIMP COAD samples. Clinicopathological and molecular genetic characteristics of COAD samples are represented in Table 1. Downregulation of OGDHL expression (p = 0.007) was observed in CIMP-high COAD samples (Tables 1,2, Fig. 1). Statistically significant (p = 0.049) upregulation of ENO2 mRNA level was also found in CIMP-high group. Additionally, it was obseved a tendency for PKLR downregulation, nevertheless, p-value was not statistically significant (p = 0.165). We found a significant decrease in OGDHL mRNA level in CIMP-high COAD samples compared to non-CIMP ones. As the aberrant methylation of promoter region is one of the most frequent mechanisms of expression decrease, we assessed if this does contribute to OGDHL downregulation in COAD. CpG methylation status was analysed based on TCGA data derived with Illumina Infinium HumanMethylation450 microarrays. Whereas these samples didn’t have information about CIMP status in the TCGA annotation, we used the developed approach (see Materials and Methods) of identifying “non-CIMP”, “CIMP-low”, and “CIMP-high” groups based on methylation profiling with the microarrays. For at least nine CpG sites in OGDHL promoter region, we found a differential methylation between “non-CIMP” and “CIMP-high” samples (Fig. 2). This fact demonstrates that some loci could serve as additional markers of high methylation level across the genome. Glycolysis and TCA cycle are interconnected to various cell signaling and metabolic pathways that are important in the context of carcinogenesis and found to be frequently disturbed in tumors: fatty acid and lipid biosynthesis, synthesis of amino acids and nucleotides, stabilization and degradation of HIF1-a, and others. Many genes involved in glycolysis and TCA cycle are considered to be prognostic markers for different cancer types. In the present work, we found a clear trend towards upregulation of glycolytic genes in colon adenocarcinoma, especially CIMP-high tumors. Indeed, increased glycolytic rate, a hallmark of cancer cells, represents not only a mechanism of adaptation to hypoxic conditions but provide a source of ATP and building material that met needs of intensively proliferating cells . We focused on two KEGG pathways, hsa00010 (“Glycolysis/Gluconeogenesis”) and hsa00020 (“TCA cycle”). Despite the names, these KEGG pathways partially intersect to each other and contain additional metabolic branches. Cancer cells are characterized by activation of glucose catabolism together with mitochondrial dysfunction and commonly inactivated glucose synthesis. Thus, ATP and the intermediate products required for active growth and proliferation are produced intensively [47, 48]. We found expression upregulation of ten genes (1.5–3-fold) and downregulation of three genes (1.3–2-fold) participating in glycolytic process. The first stage of this process is the phosphorylation of glucose catalyzes by hexokinases (HK1, HK2, and HK3). Traditionally, it has been believed that the expression level of hexokinases, especially HK2, is increased in colorectal cancer [49, 50, 51]. However, we have previously demonstrated a decrease in the expression of HK1 and HK2 in majority of colorectal cancer samples . In the present study, we observed decreased HK2 expression, and upregulation of HK3 expression in COAD. In hepatocellular carcinoma, overexpression of hexokinase 2 is associated with HK2 CpG island hypermethylation and hypomethylation of surrounding promoter regions. These methylation state changes can serve as a prognostic marker . The HK2 promoter region contains binding sites for AP-1 transcription factors, as well for the Myc proto-oncogene and mutant forms of p53 . Mutant forms of p53 activate HK2 expression, and can account for the relationship between the loss of cell cycle control in rapidly growing tumors and activation of glycolysis. High levels of HK2 expression were observed in the invasive margins of colorectal tumors . In combination with decreased p-PDH expression, HK2 overexpression may represent a marker of unfavorable prognosis, tumor aggressiveness, and recurrence in patients with colorectal cancer . HK3 is expressed at high levels in the bone marrow and spleen. Previously, we have shown a frequent and significant increase in HK3 expression (more than 100-fold) in colorectal cancer . However, the absolute number of HK3 transcripts in cells is significantly lower than that of the other hexokinases. We also found 1.5-fold (on the average) upregulation of GAPDH, encoding for glyceraldehyde-3-phosphate dehydrogenase, a key glycolytic enzyme that is present in all tissues and has multiple functions [56, 57]. GAPDH is traditionally referred as an endogenous control gene for qPCR, however, its increased expression has been reported for various malignant tumors [58, 59, 60, 61, 62, 63, 64]. GAPDH plays an important role in the formation of malignant tumor phenotypes and is considered as a promising target for therapy [16, 17]. Glycolysis rate is regulated both at gene expression level and allosterically (enzymes can be inhibited with their products). It can be assumed that the observed overexpression of PFKM, ALDOC, GAPDH, and ENO1 contribute to the activation of glycolysis. For several tumor types, the main activator of glycolysis is PFKM, and inhibition of this enzyme significantly reduces the growth and invasion of tumor cells [65, 66]. Increased ALDOB and ALDOC expression can lead to Wnt-signaling pathway activation in tumor cells, which contributes to disease progression . However, in gastric cancer and hepatocellular carcinoma, the opposite effect has been demonstrated, and decreased ALDOB expression was found to be associated with poor prognosis [68, 69]. Increased ENO1 expression is observed in many types of malignant tumors and is associated with aggressive phenotypes [70, 71, 72]. Enolase is considered a promising target for anti-cancer therapy . Upregulation of PGK1 is associated with the rapid progression and metastasis of stomach carcinoma [74, 75], as well as with the progression of breast, prostate, pancreatic, and ovarian cancers [76, 77, 78, 79]. Inhibition of PGK1 may also represent a method of antitumor therapy [74, 80]. Traditionally, lactate dehydrogenase is thought to be associated with the progression and aggressiveness of tumors, as lactate accumulation causes microenvironmental acidification, destroys the intercellular matrix, and enhances metastatic spread . Hypermethylation of the LDHB promoter and decreased gene expression are observed in various tumor cell lines. These events may be associated with intensive proliferation, migration, and invasion [82, 83]. In contrast, in triple-negative breast cancer cells, increased LDHB expression is observed, and associations between LHDB overexpression and unfavorable prognosis were demonstrated. However, despite contradictory results, LDHB is an important participant in carcinogenesis and is considered as a potential target for anti-cancer therapy . We revealed activation of some glycolytic genes as well as suppression of genes involved in gluconeogenesis including G6PC and PCK1. The G6PC enzyme catalyzes the synthesis of glucose from glucose-6-phosphate, whereas PCK1 encodes a key gluconeogenesis enzyme catalyzing the conversion of oxaloacetate to phosphoenolpyruvate. Downregulation of G6PC gene probably leads to the accumulation of glucose-6-phosphate, the excess of which can be converted to ribose-5-phosphate and used for the synthesis of nucleotides [85, 86]. We found the significant activation of ALDH3B2 expression in COAD samples. This gene encodes one of the isozymes of aldehyde dehydrogenase. It is possible that the product of the ALDH3B2 gene could serve as the enzyme protecting tumor colon cells from ROS (reactive oxygen species), considering that expression of other alcohol dehydrogenase isozymes (ADH1B and ADH1C) is decreased . We found decreased expression of a number of genes involved in the TCA cycle and related processes. Decreased expression of aconitase, encoded by ACO1 and ACO2, is described for many types of tumor cells, and represents an unfavorable prognostic marker in gastric cancer . The decreased activity of these enzymes increases the amount of citrate in the nucleus, which can then be sent to the cytosol. Excessive citrate is usually converted to acetyl-CoA, which is actively used by tumor cells for de novo fatty acid biosynthesis. Elevated citrate lyase (ACLY) expression indicates active acetyl-CoA synthesis. A characteristic feature of various types of malignant tumors is the rapid growth of tumor biomass and the related activation of lipid biosynthesis . Suppression of ACLY expression reduces the population of cancer stem cells in many cell lines with a wide range of genetic differences . Decreased expression of genes encoding subunits of succinate dehydrogenase (SDHx) can result in the accumulation of succinate, which helps to stabilize HIF1-a . The HIF1-a transcription factor regulates many genes involved in carcinogenesis and tumor angiogenesis . Disturbances in the expression of oncogenes and tumor growth suppressor genes, such as p53 and HIF1-a, can directly or indirectly affect the expression of various components of the TCA cycle . In many types of tumor cells, the degree of TCA cycle productivity is related to glutamine enzyme activity, which directs glutamine to the cycle in the form of alpha-ketoglutarate , explaining the extreme dependence of certain types of tumors on glutamine . Tumor cells need to maintain a high level of TCA cycle metabolite biosynthesis, including that of alpha-ketoglutarate and isocitrate, which can be transported to the cytoplasm to participate in the synthesis of nucleotides and a number of amino acids [95, 96]. Increased expression of IDH2, encoding for a mitochondrial form of NADP+-dependent isocitrate dehydrogenase, is associated with this. The IDH2 enzyme is able to perform both direct and reverse reactions, converting isocitrate to alpha-ketoglutarate and vice versa. Thus, deficiency of any of these important intermediates can be compensated. NAD+-dependent isocitrate dehydrogenase (IDH3) and its isozymes catalyze the TCA cycle limiting step and their role in the development of malignant tumors has been actively investigated [97, 98, 99]. Only the IDH3 enzyme only catalyzes a direct reaction, but it is allosterically regulated and adjusts activity to the needs of the cell . The existence of tumors characterized by simultaneous hypermethylation of a large number of CpG islands was described in colorectal cancer and called the CpG island methylator phenotype . This molecular phenotype occurs in 15–20% of malignant colorectal tumors . Development of CIMP-positive tumors is associated with elderly age, female gender, higher degree of differentiation and mucinous histological type, localization in the proximal colon, mutations in KRAS or BRAF, and wild-type TP53 [25, 102]. The mechanisms, through which aberrant DNA hypermethylation is induced in CIMP-positive tumors, are not absolutely clear, but there several factors may be associated with this process. These include metabolic shift towards energy production via glycolysis or the development of more pronounced Warburg effect. Our study revealed CIMP-high associated changes in the expression of genes involved in energy metabolism, including participants of glycolysis, TCA cycle, as well as related processes. For CIMP-low COAD, metabolic alterations were reported in different samplings . Methylation pattern as well as mutational status and other genetic characteristics allowed creating a consensus molecular classification system consisting of four robust subtypes with clear biological interpretability . Distinct differences in the intrinsic biological underpinnings of each molecular group provide the new taxonomy of this disease. Important associations were found between CMS subgroups and clinical variables, as well as prognosis. CMS1 tumors were frequently diagnosed in females with right-sided tumors with higher grade and had very poor survival after relapse. It is likely that this phenomenon is associated with the presence of samples with MSI-high status and BRAF-mutations as the main part of CMS1 subgroup. CMS2 tumors were mainly left-sided and had superior survival after relapse. CMS4 tumors tended to be diagnosed at more advanced stages; they are more aggressive and displayed worse overall survival . The analysis of TCGA RNA-Seq data in CIMP-high versus non-CIMP COAD samples revealed altered expression levels of many genes involved in energy metabolism, including ENO2, PKLR, and OGDHL. Alterations observed in ENO2 and OGDHL genes were validated by qPCR. Enolase is a glycolytic enzyme that catalyzes the conversion of 2-phosphoglycerate into phosphoenolpyruvate. In mammalian tissues, enolase is represented by three tissue-specific isozymes [103, 104]. Enolase 2 (ENO2) is induced by hypoxia, which typically occurs in tumors. Along with other glycolytic genes, ENO2 was previously found to be overexpressed in colorectal cancer and other cancer types [105, 106, 107]. ENO2 (alpha-enolase) is significantly upregulated in a metastatic colon cancer cell line, suggesting a possible association with the metastatic process in vitro and in vivo . Moreover, ENO2 is a prognostic factor of small cell lung, breast, and prostate cancer [109, 110, 111, 112]. qPCR analysis revealed statistically significant differences in ENO2 expression in CIMP-high and non-CIMP COAD samples (p = 0.049). Pyruvate kinase, PKLR, is highly expressed in liver tissues and red blood cells. Analysis of PKLR expression revealed its association with metastases. PKLR promotes colon cancer cell metastases to the liver, but does not promote basal cell growth in culture . PKLR provides cell survival in the central parts of a tumor, where the cells are in conditions of high density and hypoxia. Under these conditions, PKLR is required to maintain levels of the major endogenous antioxidant, a glutathione, and support cancer cell survival . Our results show that the average mRNA level of PKLR in CIMP-high tumors is approximately 5-fold lower than that in non-CIMP COAD samples. However Mann-Whitney test have not been demonstrated statistically significant p-value for this gene (p = 0.165). OGDHL expression demonstrated the most striking differences between CIMP-high and non-CIMP samples, based on both TCGA and qPCR data. This gene encodes a subunit of the oxoglutarate dehydrogenase complex, which is involved in the TCA cycle as well as in the induction of apoptosis. Various pathways and factors causing apoptosis can be classified as either extrinsic or intrinsic. The extrinsic pathway begins from the activation of apoptosis-associated receptors by various ligands, including Fas and TNF. Intrinsic apoptotic pathways are induced by DNA damage, oxidative stress, and other factors . Mitochondria play a central role in both cases. The mitochondrial intermembrane space contains a number of pro-apoptotic proteins including cytochrome c (Cyto c), endonuclease G, and apoptosis-associated factor (AIF). Bax/Bak are involved in the formation of the mitochondrial outer membrane permeabilization pore, which leads to the release of cytochrome c and other proteins into the cytoplasm [115, 116]. In turn, cytochrome c causes oligomerization of the Apaf-1 and further assembly of the apoptosome, which is responsible for cleavage of pro-caspase 9, a key step in apoptosis [16, 115, 117]. Mitochondria and the glutarate dehydrogenase complex in particular, are the main source of free radicals within the cell . It was shown that OGDHL, and its close homolog OGDH, are localized in the mitochondria, and that overexpression of OGDHL results in increased free radical content and lipid peroxidation . In present work a significant decrease was found in OGDHL expression in CIMP-high COAD samples compared to non-CIMP ones. And at least nine CpG sites have sufficiently different methylation pattern in these two groups. Probably these particular CpG sites along with decrease expression level could serve as additional markers of high methylation level across the genome. Therefore, we have demonstrated that COAD samples characterized by CIMP-high status (mostly represented with CMS1 group) carry metabolic alterations together with activation of immune-related pathways. Partially, these changes could be explained by the presence of transcripts originated from the tumor infiltrating lymphocytes. We have revealed that the energy metabolic changes manifested in the overexpression of glycolytic genes along with the downregulation of genes participating in TCA cycle are associated with the CIMP-high status in COAD. 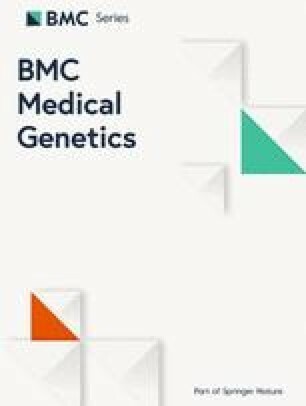 This results are consistent with the conception assuming that hypermethylation of cancer genome is correlated with the increased glycolytic rate. At the same time, we also found significant activation of the genes involved in immune-related pathways in CIMP-high COAD samples, which is a hallmark of the "Immune" subtype (CMS1) and represents an important prognostic factor of colorectal cancer. Probably, all common CRC molecular characteristics are intertwined and occur in several CMS subtypes. Authors thank National Medical Research Radiological Center and State Hospital №57 for tissue samples. This work was performed using the equipment of EIMB RAS “Genome” center (http://www.eimb.ru/rus/ckp/ccu_genome_c.php). This work and publication costs were financially supported by the Russian Science Foundation, grant no. 14–15-01083. AVK, MSF, GSK, ADK, DVS, and IAI wrote the manuscript; AVK, ARZ, NVM, AYP, and AAM conceived and designed the work; MSF, SLK, EAP, and ZGG performed the experiments; ENS, AAK, AVL, MAC, and MVK analyzed the experiments; ENL, AVS, AAD, GSK, and IAI performed bioinformatics analysis. All authors read and approved the final manuscript. The study was approved by The Ethics committee of Hertzen Moscow Cancer Research Institute, branch of the National Medical Research Radiological Center, Ministry of Health of the Russian Federation. All participants gave their written informed consent to take part in the study. The study was done in accordance with the principles outlined in the Declaration of Helsinki (1964).